I like to use slow cooker to make soups or braise meat as I don't have to watch over the stove fire. Just dump all the prepared ingredients and add the required amount of water in the slow cooker, set the heat element accordingly and leave it to cook. It really saves my time to attend to other chores. Below my slightly modified in quantity adjusted to our taste. Wash clean and place chicken breasts in the inner pot of the slow cooker. Put all the ingredients over the chicken, mixing a few times with a spoon and ensure the meat is thoroughly coated. Cook on high for about 2 - 3 hours. Flip the chicken half-way through cooking if you wish. Once cooked, remove chicken from slow cooker and shred with two forks, set aside. Reserve the *sauce for making the sesame vinaigrette and tossing in chicken as needed. Garnish with toasted sesame seeds and some finely chopped spring onions. Put all the dressing ingredients in a screw-top jar and shake until well combined. Refrigerate for an hour. Boil a pot of water to cook the soba noodle per instruction on packaging. Drain and rinse under cold water. Set aside. Combine the shredded honey-lime chicken, capsicums, cabbage and cucumber in a large bowl. Toss and mix half with the vinaigrette dressing. Toss the soba noodles with remaining vinaigrette. Not to put to waste of that 3 tablespoons of remaining sauce from the slow cooker, I added in as well. To serve, place some soba noodles on a plate and topped with the chicken salad. Garnish with some sesame seeds and spring onions. Adjust the quantity of greens/cabbage etc. to your preference. Top with some seaweed strips the next time when I make this soba noodle salad. 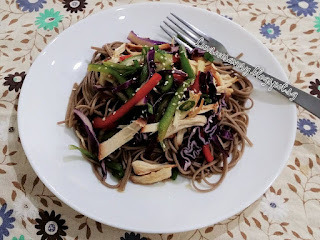 I was quite sceptical that my family may not like the taste of sweet tangy chicken salad with cold soba noodle. Glad that my family kinda liked this fusion dish. Happy cooking and have a great week ahead! 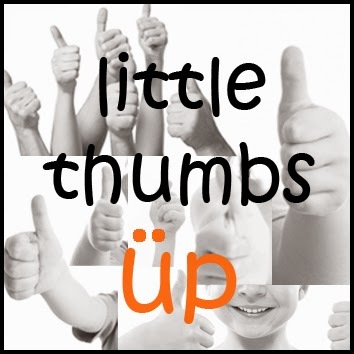 Linking this post to Little Thumbs Up March 2016 Theme Honey organised by Zoe from Bake for Happy Kids and Doreen from My Little Favourite DIY, and hosted by Joycescapade. Hi Karen, love everything about this salad, soba noodles are my favorite type I love the texture. Great fusion dish. Hi Karen, I like this combination of chicken and noodles. So healthy! Karen, that look so delicious! 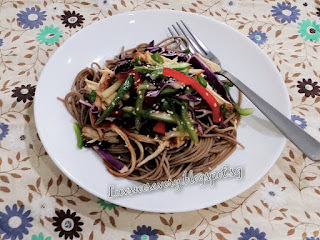 How I wish I could have your noodle salad for dinner! It surely looks like a perfectly balanced and delicious meal! Hi Karen, this soba noodle looks just like one that I used to love when I was working in the CBD area. Love that I can now recreate this at home! This is the kinda one-dish meal that would make the tummy very happy! Looks delicious! certainly looks very appetising! 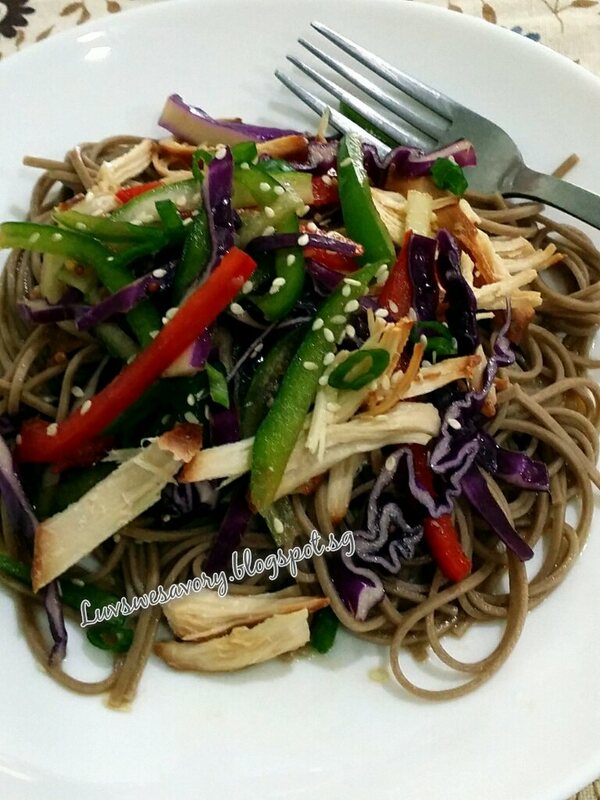 nvr thought of soba and flavours of lime, thx for sharing!